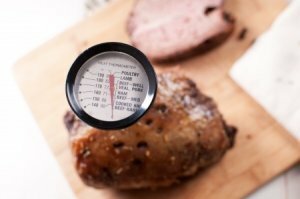 Cooking food to the proper interior temperature can help keep your family and guests safe from food-borne illness. In the kitchen, properly handling raw meat, fish, and poultry can stop most germs associated with them from multiplying to levels that can make you and your family ill. While most pathogens that occur naturally in uncooked foods are killed by proper cooking, many germs can spread long before you pop the entree into the oven. Keep germs and bacteria in check with these kitchen safety tips. When it comes to the health of your family and guests, you can never be too careful. In the refrigerator: Thaw frozen meat overnight; large cuts may take longer so allot that possibility into your cooking schedule. On the countertop: Place chicken (or any frozen meat) in a watertight plastic bag and submerge in a bowl of cold water. Leave until just thawed, changing the water every 30 minutes. Cook or refrigerate promptly. In the microwave: Use the defrost setting, then finish cooking immediately. Wipe cooking surfaces clean with hot, soapy water before and after cooking; rinse the surface thoroughly; dry well with paper towels. Wash hands (with soap and hot, running water) before preparing food and after touching raw meat. Wear rubber gloves if there are cuts or sores on your hands. Use separate cutting boards for meats and nonmeats (or disinfect with mild bleach solution between uses). When pounding meat or chicken, cover with a layer of plastic wrap to avoid splattering juices. Wash (with hot, soapy water) all utensils that have touched raw meat. Keep drippings from raw meats away from other food. Disinfect surfaces after contact with raw meat or juice from meat. Rinse fruits and vegetables thoroughly before eating or cooking them. To rid them most effectively of germs and pesticide residue, wash them in a pint of water with a few drops of dishwashing soap added; rinse thoroughly. Wash in hot, soapy water any utensils that were used in preparing food before using them to serve food. Eat hot food while it is still hot; eat cold food while it's still cold. Date leftovers and use them promptly; if in doubt about freshness, discard the questionable item. It's not worth a tummy ache in your home.